Taylor Lautner is an American actor who first became famous for his performance in The Adventures of Sharkboy and Lavagirl in 3-D! However, most of us know him as the sizzling hot Jacob Black from the Twilight series! Taylor is also a martial artist, who, at the age of 16 has already won a number of competitions in his field. No matter how amazing he is though, he cannot escape Cartoonize The World. 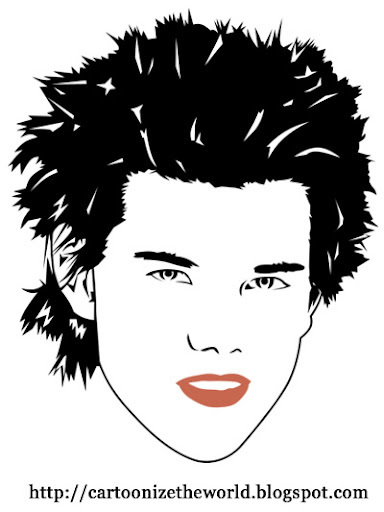 Jacob Black, you've been cartoonized. Uh.... I'm sorry, but even your awesome cartoons don't make Taylor look pretty...yuck. I never got my email yesterday. What is up? HA! The hair looks awesome!! this guy don't looks like my lovely taylor! Eww. This makes him look ugly. And I'm a Team Jacob, so that's saying something.